Myrtle rust (Puccinia psidii, eucalyptus rust or guava rust), is an exotic fungal disease detected for the first time in Australia on the central coast of New South Wales in 2010. Plant Biosecurity CRC researchers have been tracking the effects and spread of myrtle rust – with sobering findings. One of the reasons that myrtle rust is so damaging in Australia is that the host range is vast and continues to grow, with more than 350 species now reported as susceptible from 57 genera, Dr Pegg explained. 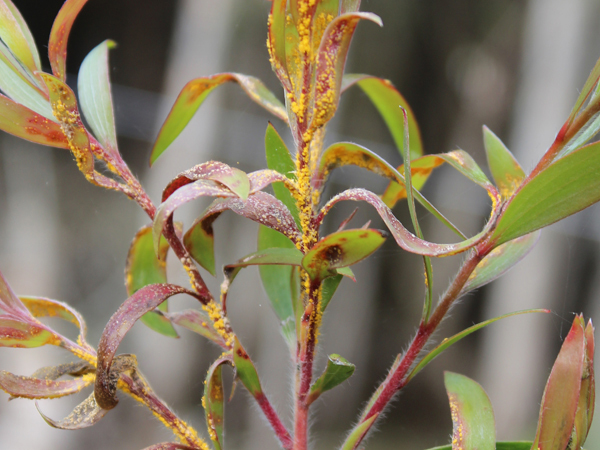 Myrtle rust infection of growing tips results in dieback and prevents flowering in Melaleuca quinquenervia. “Impacts are also being seen at plant community level, particularly in Myrtaceae-rich ecosystems,” said Dr Pegg, such as Wet sclerophyll, Coastal heath and Melaleuca wetlands. Fortunately, opportunities to incorporate myrtle rust-resistant trees in revegetation programs exist for some species. This is particularly the case for the broad-leaved Melaleuca spp. (M. quinquenervia, M. leucadendra, M. viridiflora). Melaleuca quinquenervia are key to maintaining and improving water quality, as well as being important to a range of wildlife. They provide valuable nesting or roosting sites for a number of bird and bat species, and are an important food source for migratory birds. From an industry perspective, the developing lemon myrtle (Backhousia citriodora) industry has been one of the hardest hit by the disease. Lemon myrtle leaves contain oil with the highest citral content of any known plant in the world – the lemony aroma compound used for its citrus effect. The leaves are dried and milled for use in teas or as a spice, and steam distillation is used to extract the essential oil from the leaf material, which can then be used as food flavouring, in aromatherapy products, cosmetics and toiletries. In 2012, production of lemon myrtle was estimated to be between 575 and 1,100 tonnes of leaf and three to eight tonnes of oil, with a farm gate value of between $7 and $23 million. The introduction of myrtle rust into Australia is jeopardising the growth and success of this industry, with the disease causing foliage loss, dieback and stunted growth – yield losses of up to 70 per cent have been reported in untreated lemon myrtle plantations. For more information on myrtle rust, see the Plant Biosecurity CRC website (www.pbcrc.com.au) and the Australian Network for Plant Conservation (www.anpc.asn.au/resources).